And cue the sun! I could not wait to be back in Ancient Hoi An in Viet Nam today to see if the place is as magical in daylight, as my first lantern-lit vision of it last evening. 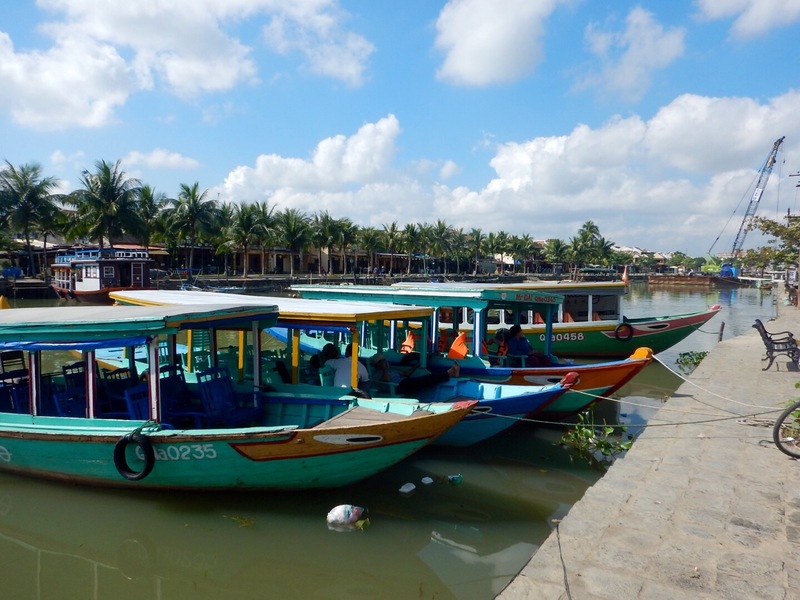 Hoi An was established as a trading post at the mouth of the Thu Bon river sometime in the first century by a civilization known as the Cham. 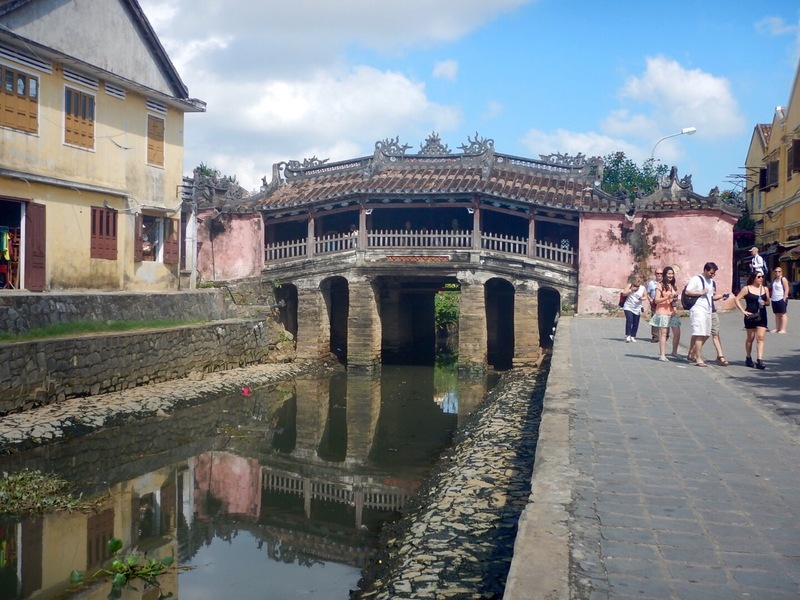 The Cham moved on somewhere around the 14th century but Hoi An, with its large, protected harbour continued to be an important stop on the trade route. It was occupied at different times by various southeast Asian countries but by the 18th century mostly by the Chinese and Japanese, whose influence is still evident. 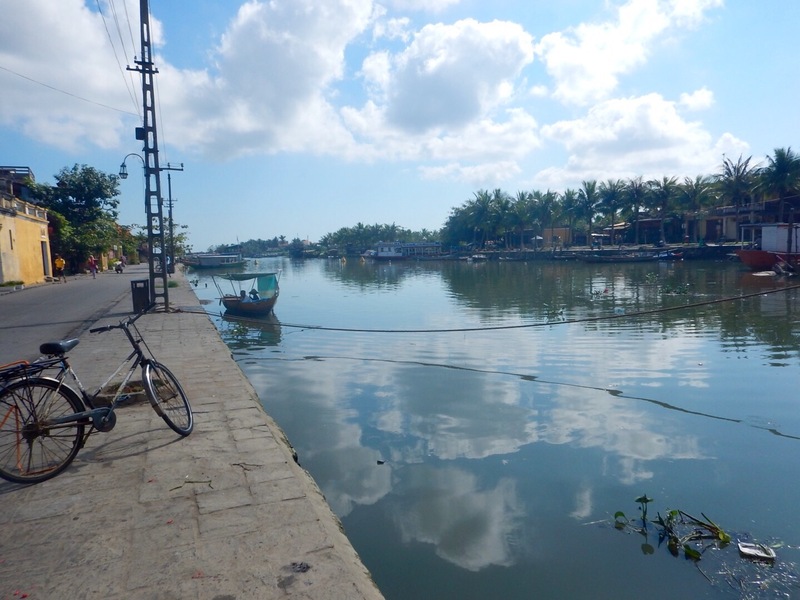 By the 19th century Hoi An had been replaced by Da Nang as the favored commercial port, ‘some say because of the silting up of the Thu Bon river‘(Wikipedia). 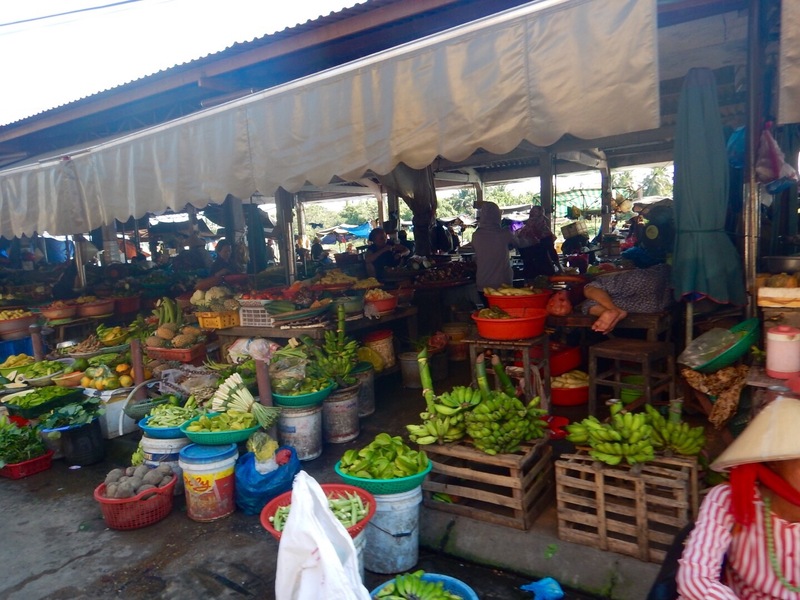 Today its population of around 120,000 relies mostly on the tourist trade and small scale commercial fishing. After all the action of the previous night most of the tourists in Hoi An seem to be sleeping it off, so I have the beautiful river walk and surrounding streets almost to myself. The large boom behind these colourful fishing boats is dredging silt that washes down from the mountains and builds up in the river. 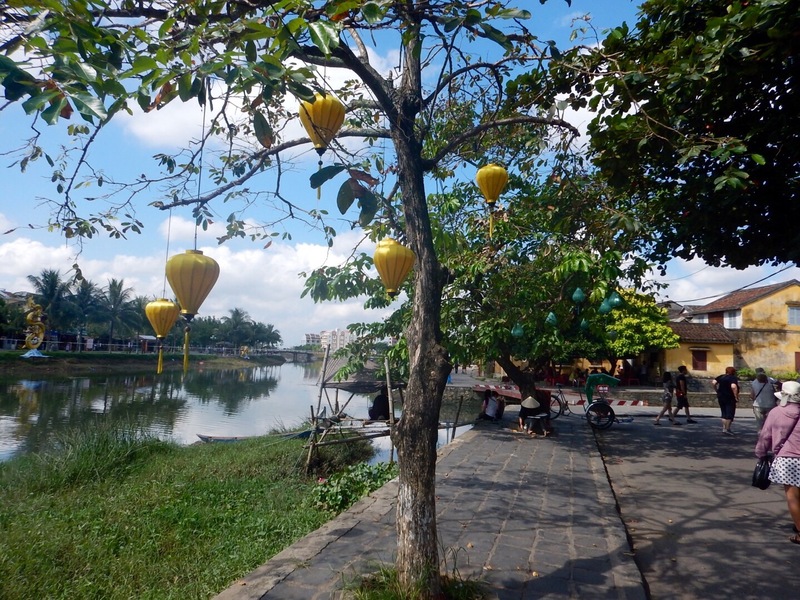 I think they must put some effort in the wee hours of each morning to removing the remnants of dozens of charming lanterns floated on the water the previous night, but some signs of the revelry are still evident. Square net fishing is seen all along the coast and waterways of Viet Nam. The fisherman (at left) raises and lowers the net by a bicycle pulley system. 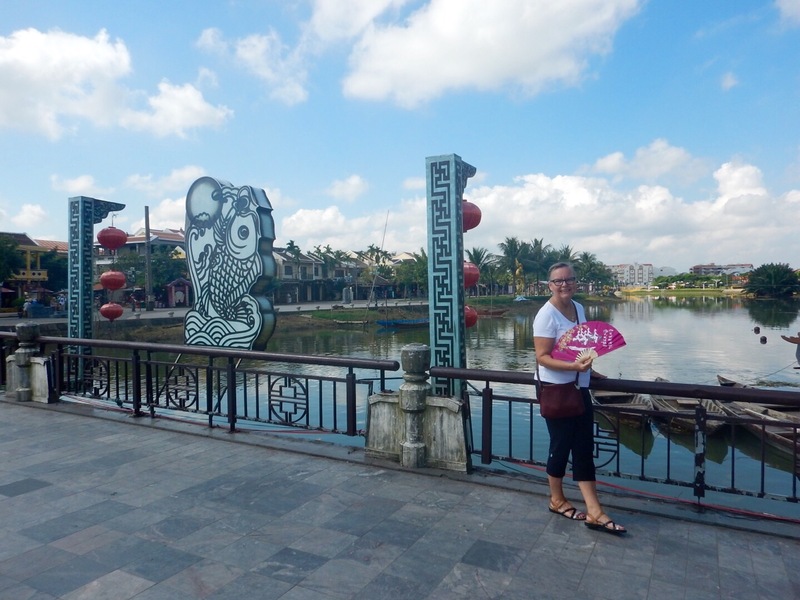 This is the same gorgeously lit footbridge that I crossed last night between the two commercial areas on opposite sides of the river with modern Hoi An in the background. 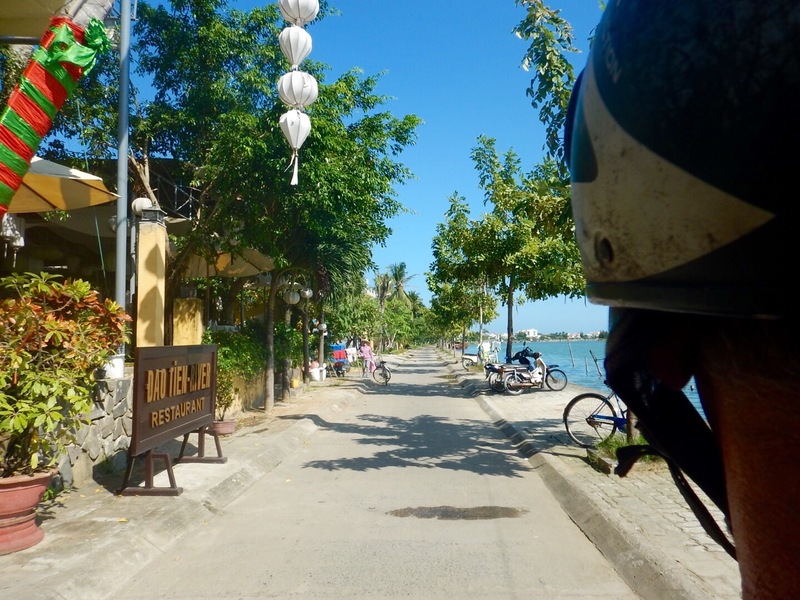 The streets of Ancient Hoi An are limted to pedestrians and cyclos. Lovely! 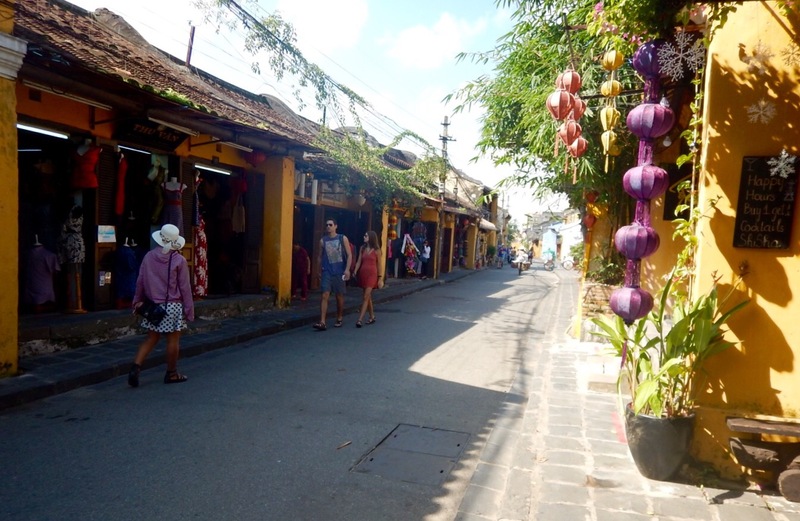 There are many delightful eateries and inns along the pathway bordering the Thu Bon. 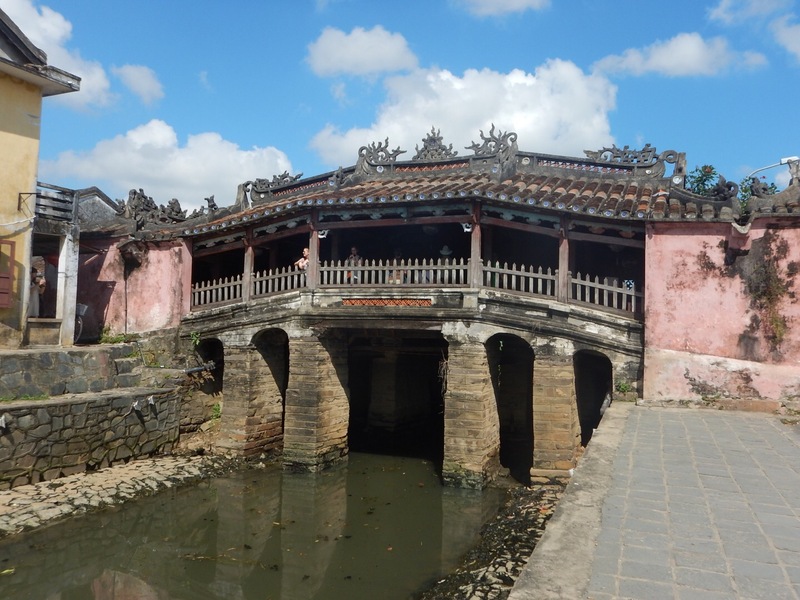 The remarkably well-preserved Japanese Covered Bridge – the official symbol of Hoi An – was built in the late 1500’s to connect the Japanese quarter of Hoi An with the Chinese section across a channel of the Thu Bon river. It’s the only bridge in the world with a temple built into one end – the temple to the God of Weather. Very little goes to waste in this country where it seems everyone finds a way to eke out a living. These women are seriously pleased with themselves for scavenging a large piece of corrugated tin that will be put to good use. 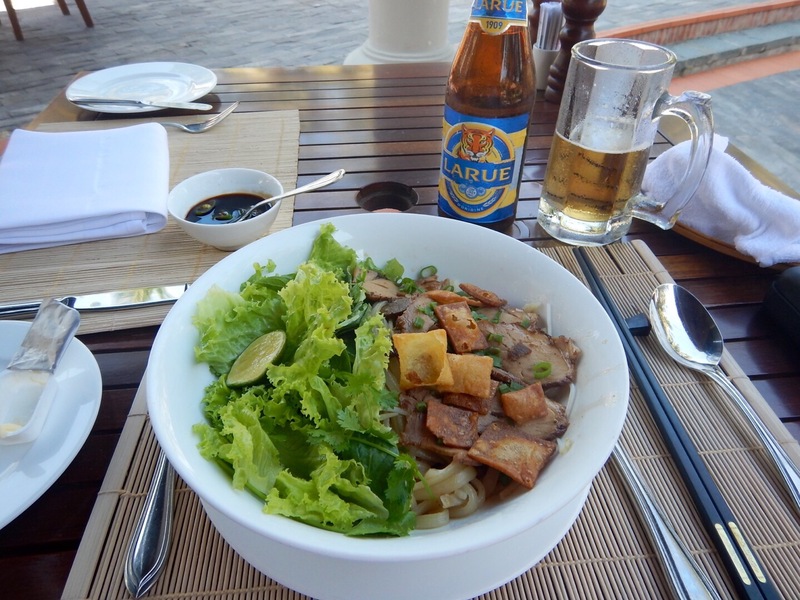 I’m told that this is Hoi An’s unique take on the wonderful pho found everywhere in Viet Nam. The crisp rice crackers that top this bowl are made by hand and set to dry in the sun. 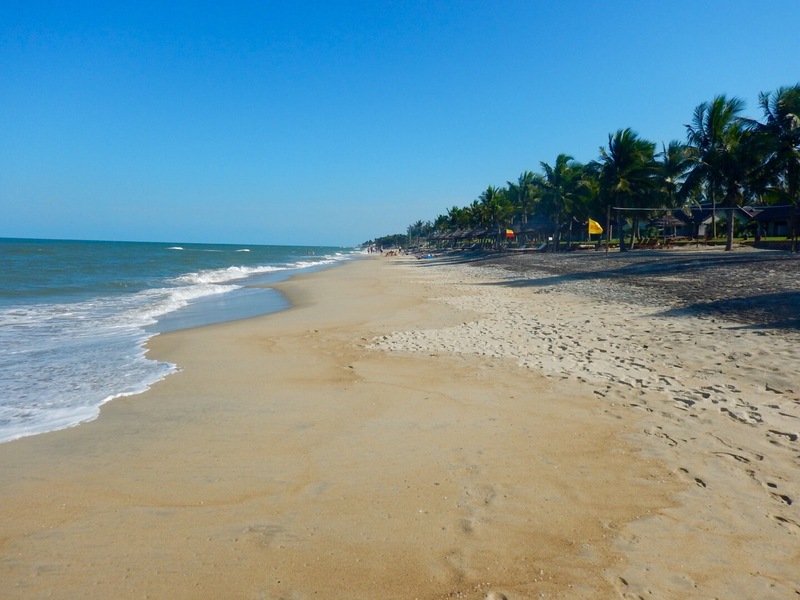 I spent the afternoon enjoying the beautiful beach in front of the Palm Grove Resort in Hoi An. This is one of the most beautiful stretches of beach that I’ve seen anywhere, generally safe for swimming and warm enough that you can just walk into the water. 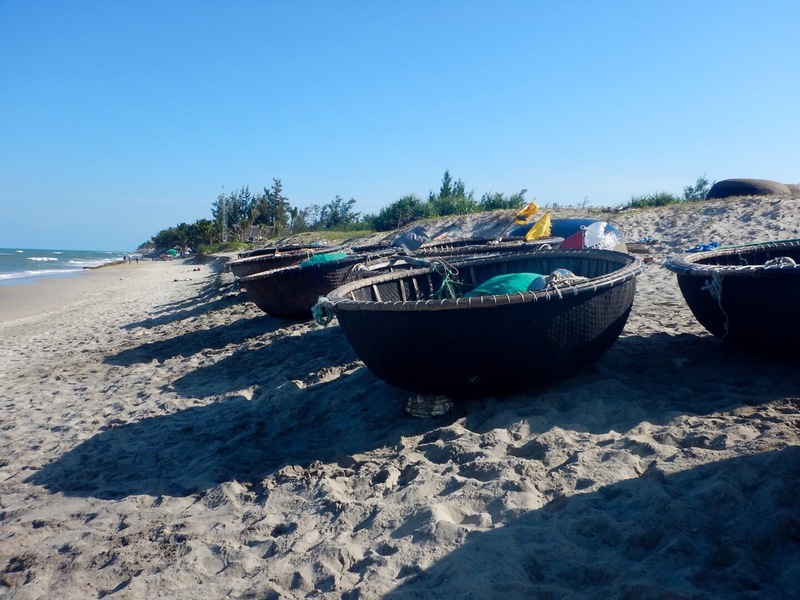 Basket boats or round boats are unique to Viet Nam and have remained almost unchanged since early times. 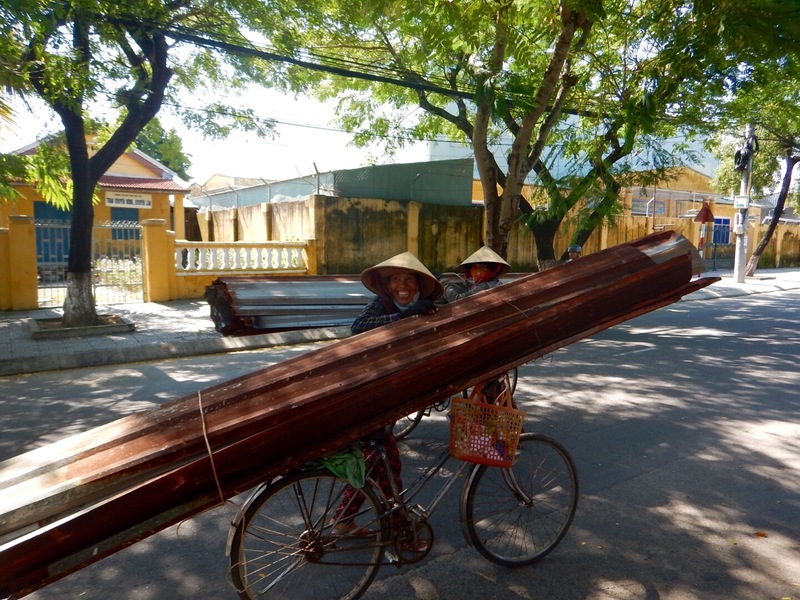 I saw these seemingly unwieldy, woven bamboo boats being expertly maneuvered by fisherman, who stand almost on the rim of one side, and both steer and propel the boat with a long paddle. Quite remarkable. If you read the classic R.L. Stevenson novel Treasure Island, you might remember young Jim making good his escape from Long John Silver in something called a coracle. It was one of these round boats. 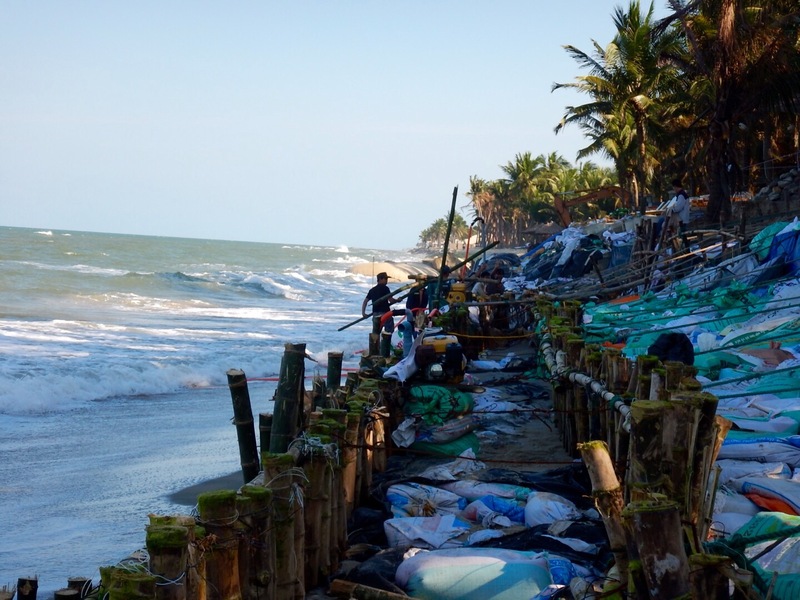 It’s not all blissful paradise along this beach, as Viet Nam struggles with shoreline erosion. 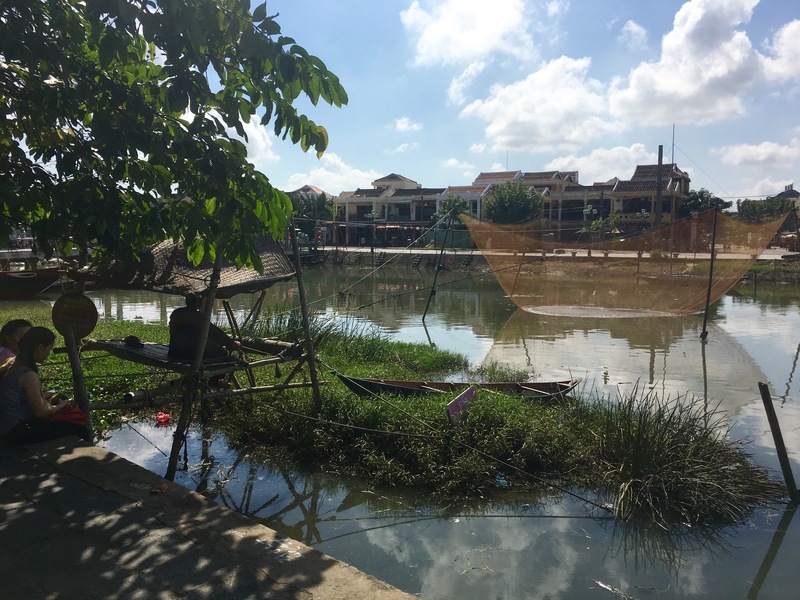 There are differing opinions about the cause – global warming, dredging of the nearby Thu Bon River, or simply a natural process. But whatever the cause, the price being paid by some beachfront resorts and businesses is devasting. 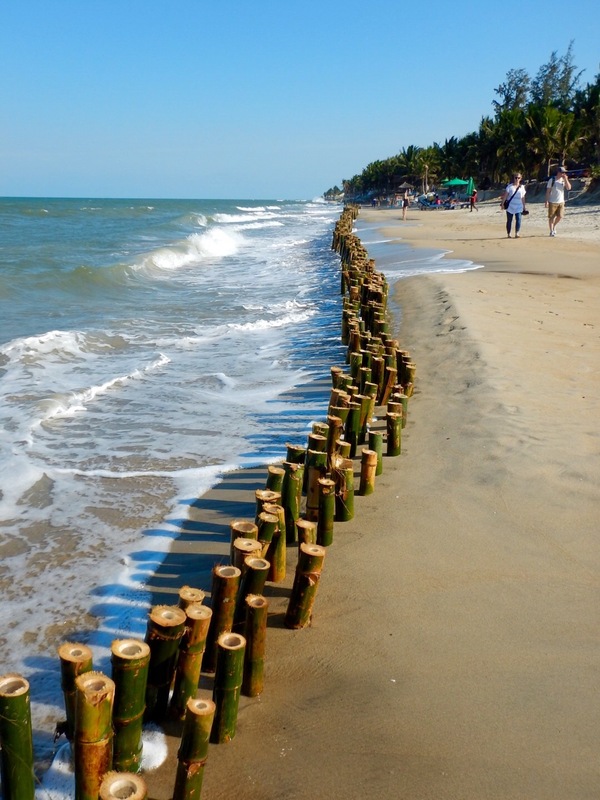 Various methods are being tried to keep the beach from being dragged out to sea – some more effective than others. 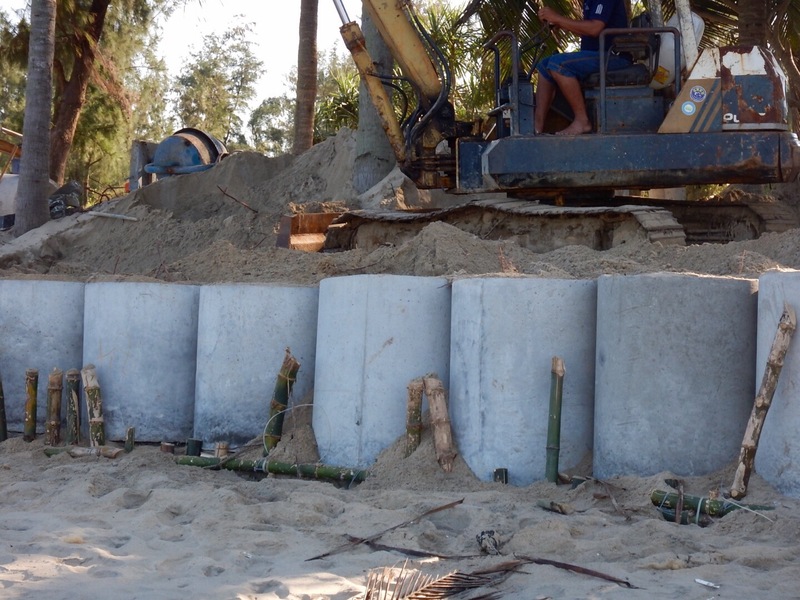 This work in progress seems a desperate and expensive method but the beach resort – now stranded high above this eroded shoreline – has few other options. This project looks to my uneduacted eye as if it might be more effective but also much more expensive.